“Local” for this challenge will mean somewhere in New England. I know, it could be more local than that. Maybe for the next challenge we’ll pull in the boundaries. Items that are in our allowable “pantry” include oils, vinegars and flours. And I reserve the right to add in quinoa as a “cheater” grain. Leftovers that were in our fridge need to be eaten, right? And trust me, we did not stock the fridge with “leftovers” so we could cheat with them. Our “veganish” diet – two out of three meals not containing animal products – will be put on hold for the week. Hey, that’s not so bad, right? So far, so good. To prep for the challenge, I hit the closest local farmers market I could find, which just happens to be at Boston Medical Center on Fridays. I came back with butternut squash, two eggplant, red peppers, dinosaur kale, two heads of leaf lettuce and romanesco – it’s like a fractal-influenced head of broccoli. All produce brought to us by the good folks at Farmer Dave’s in Dracut. We also stopped by Whole Foods to find some local dairy products. And you know what? We did actually find some. So, with that, let the challenge begin! Breakfast: We need coffee. Coffee doesn’t grow in this climate. What to do … Well, there are local coffee roasters. That counts. And our favorite local coffee roaster is Flat Black Coffee Company with locations in Dorchester and downtown Boston. We’ve known the owner for years and can attest he and his crew produce a great and responsible bean. Into that cup we usually pour some almond or soymilk. Not happening this week, so how about some local milk? We picked up some Maine’s Own Organic Milk. 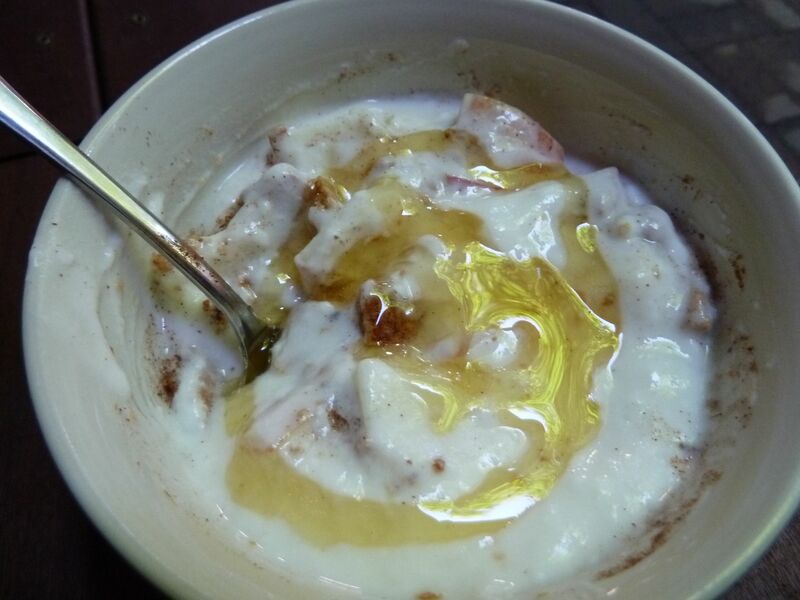 Yogurt, apple and honey - all local! The coffee accompanied a bowl of Stonyfield plain yogurt – I’m positive all that dairy is from New England cows and if not, someone clue me in – mixed with a local chopped apple and topped with Topsfield-produced honey. Breakfast, done. Lunch: Okay, so … It’s Columbus Day. Jennifer’s off work, and I’m working but not all that hard … A friend calls us. Hadn’t seen her in a while. “Wanna go out for lunch?” Say no? No. We said yes. And we opted to eat at a small, local Mexican restaurant two blocks away where I know they a) make a lot of their own stuff and b) could use our dining dollars. I feel completely in-line with the challenge by supporting our local small eateries. Dinner: Gotta clean out the leftovers from the fridge, right? Pasta with shrimp, red pepper and pesto. And just the pasta and shrimp weren’t local in that dish. Plus, we had homemade bread. And, a bottle of Harpoon IPA brewed right down the street in Southie. Day 2 should be interesting—it’s our first Cape Ann Fresh Catch share pick-up. Fish with heads!! Awesome! you forgot to mention that the pesto on the pasta was homemade and the red pepper from the local farmers market and the chiffonade fresh basil also from our garden. 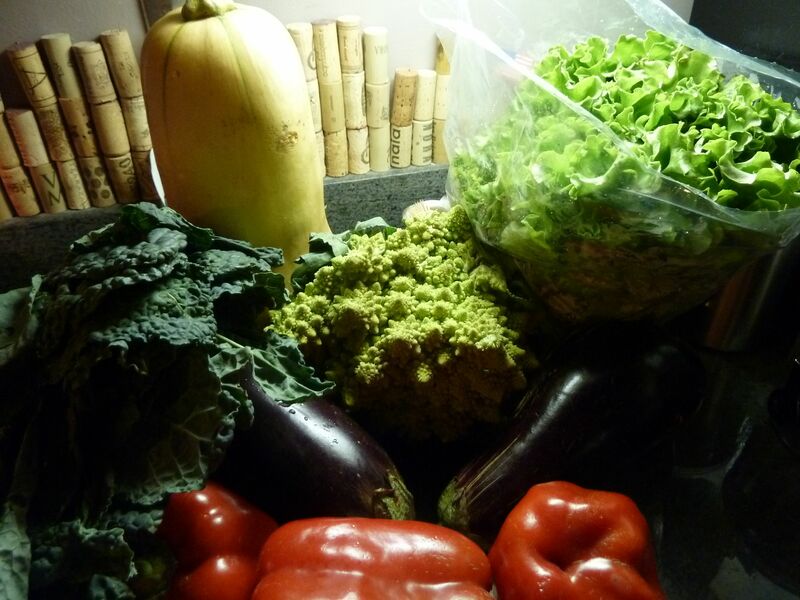 You are currently reading Homegrown Food Challenge: Day 1 at The Dainty Dot.